Sensiba San Filippo (SSF) became a Certified B Corporation in 2018. B Corps are a new type of company that uses the power of business to solve social and environmental problems. B Corp certification is to business what Fair Trade certification is to coffee or USDA Organic certification is to milk. Why SSF Became a B Corp? Sensiba San Filippo exists to help people. We use our professional and personal skills to improve the lives of our families, our communities, our clients and our colleagues. Through our service to others, our commitment to integrity, stewardship of the environment and kindness, we intend to better the lives of those we touch directly. Indirectly, we strive to be a positive force in the global community. The B Corp certification helps us better assess how our core values are aligned with our daily operations and where to improve. Click Here to view our 2017 Community Impact Report. Community service is a core value celebrated and encouraged at SSF. 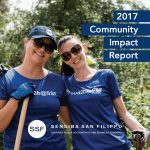 On June 24, 2016, we spent our Annual All-Hands Day at the Guadalupe River Park doing park clean-up as a part of a firm-wide celebration of giving back to the community..
Do you know of a volunteer opportunity in the Bay Area that could benefit from the help of the Sensiba San Filippo team? Contact us today and we’ll see how we can help! SSF also hosts an annual “All Hands Volunteer Day” each June where the firm shuts down for the day, and leverages their large employee base to volunteer with a local nonprofit. In the past few years we have helped: Sunflower Hill Hagemann Ranch (2017), Guadalupe Parkway River (2016), Alameda Point Collaborative (2015), St. Vincent de Paul (2014), The Oakland Zoo (2013), and ValleyCare Hospital (2012). To help celebrate our 40th anniversary we supported a different nonprofit each week for 2017 and donating $40 a day to that charity. So, how do we pick which charities? Our money has always followed our people. Each nonprofit we are supporting is a nonprofit one of our employees is involved with. We not only support the community, but our employee’s passions.